We offer a convenient delivery service to your building or landscaping site, business premises, home, utility works or sites where pipe laying or duct laying is being carried out. We service areas within a 20 mile radius of the Oldham area. If you require a grab truck outside this area please contact us as we may well be able to assist you. We work for driveway companies and builders, universities, schools, utilities and telecommunications companies. 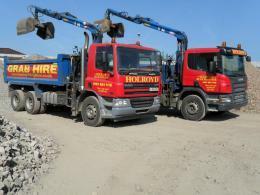 Groundwork companies and civil engineers also make regular use of our professional service. We can also work with domestic and commercial landscaping businesses that require us to remove soil, spoil, rubble, dig-out from sites being redeveloped. Our grab hire service offers the most efficient and cost-effective way of clearing non-hazardous waste, soil, spoil, timber, green waste, dig out, industrial waste or unwanted materials from both domestic and commercial site. 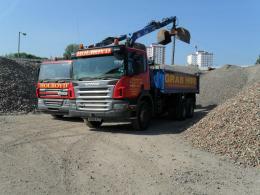 Our Trucks carry up to 12 tonnes. We charge by the load or by date rate. We consult with our clients to ensure the correct rates are given. All our grab lorry drivers are fully trained and insured and come with experience, which means you can be confident of a prompt, professional service. 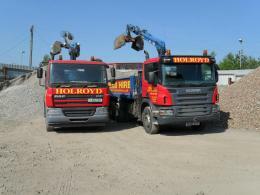 All drivers are CPCS and NORPS cards holders - Providing their skills and heath and safety awareness as plant operatives.